LOT Publications Webshop. Last in first out? The central question in this dissertation is whether first language attrition is the mirror image of first language acquisition. In other words, is it true that those linguistic features that are acquired late in children are also vulnerable to attrition? This idea is captured in the regression hypothesis. 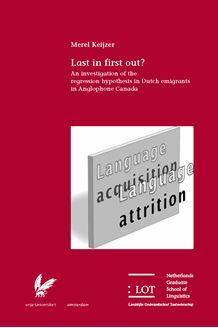 In order to test the regression hypothesis, three different groups of language users were included in the study’s design: 45 first-generation Dutch emigrants in Anglophone Canada, 45 matched control subjects in the Netherlands and a group of 35 Dutch adolescents of 13 and 14 years old. The three groups of subjects were compared regarding their morphological and morpho-syntactic proficiency, because these two language domains tend to show gradual and clear developmental sequences in children, which can easily be compared to attrition processes. All subjects were presented with a number of formal tasks, but spontaneous data samples were also collected. The findings suggest that morphology is more impaired in language attrition than purely syntactic phenomena. More importantly, the attriters and acquirers often revealed mirror symmetries in their morphological proficiency, as opposed to the control subjects in the Netherlands, thus providing evidence for regression. Syntactic phenomena, on the other hand, proved to be more problematic for the attriters than the adolescents and many English L2 influences were attested here. The research reported in this dissertation is of interest to researchers working in the fields of first and second language acquisition, multilingualism, language attrition, language change, but also morphology and morpho-syntax.